"After a relative dearth of top-notch software - lots of good software but nothing really outstanding - the Playstation market is at last starting to heat up again. 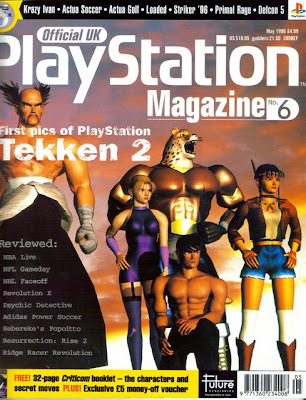 You may have noticed that star billing this issue goes to Tekken 2 - the only game to prevent Tekken being the best beat 'em up you can buy! The maddening thing is that Japanese gamers are already enjoying the pleasures of this astounding combat game, while poor old PAL players have to wait until September to get their mitts on it. Still, we thought we'd get the ball rolling nice and early, so I hope you enjoy this early look at the first game of '96 you absolutely must have. We're also particularly chuffed with this month's demo CD. Compared to the packed discs we've had over the last few issues, you may think that we've gone downhill. But before you write in complaining, just look at what we do have: Alien Trilogy, Magic Carpet and a healthy slice of Pro Pinball. Most other magazines would have been happy with just one of these demos on its own, but not PSM. We will not rest until we are the only Playstation magazine worthy of your money. Right?" "A wild, entertaining arcade soccer game. Purists may recoil in horror at some of the special moves, but we enjoy kicking people in the head. 'You dirty foulin' bast-'"
"Simple puzzling with an over-elaborate Japanese touch. Good competitive play, but not recommended for poor old Johnny-no-mates." "Undeniably fun to play, simply because EA has got the mechanics just about right. A bigger ball and a clearer picture would've made a difference." "The first delve into this sporting genre, and one which sets a high standard for would-be suitors. A complicated sport made uncomplicated." "An exciting, enjoyable simulation of ice hockey. Not as slick as it could have been, but you won't fail to have fun. Pucker up." "It's big, it's bold and it's bloody, but the nature of FMV ensures that interaction is inevitably limited. You won't play this for long." "Crippled by the success of its rivals, Resurrection: Rise 2 simply can't compete. The black sheep of a distinguished family." "If this is the state of things to come then the Saturn may become a vaguely appealing purchase... Thank God this is as bad as things are likely to get." "Not the earth-splitting event people would have you believe, but a fine game. However if you have the original, think long and hard about investing in more of the same." - This issue came with a 32 page Criticom booklet. - Spot the awful error in the editorial? He's talking about next issue's disc, not this one! - The Playstation vs. Saturn sales figure war was hotting up. Saturn claimed that it was outselling Playstation...not mentioning the fact that this was for a single week period, and only due to Playstation stock shortages. Phil Harrison: "In order to clear up the situation and confirm our leadership position, we challenged Sega to an independent audit. We proposed that Sega and Sony cover half the cost each of a respected accountancy firm to examine our books and confirm our sales. Unfortunately Sega declined. You can draw your own conclusions on what that means." In reality, Saturn was being outsold by about 4:1 at this point. - Worms being released in the US was once in doubt, apparently. OPM say that SCEA decided against releasing it because it "wasn't 3D enough". It was eventually released. - In this issue and the previous one, there were letters talking about how good it would be if there were a music creation game available. OPM weren't fans though. "Playstation is for videogames. Now let's not hear another word on the matter." 2 years later Codemasters would release Music: Music Creation for the PlayStation to critical acclaim and an OPM 9/10. - Ever wondered why some games came in double-disc cases even though they were only one disc? "At the time, there was a shortage of the officially-branded Playstation cases and so bog-standard double CD cases were used instead." - Saturn Snipes #2: highlighting a quote from the letters section again. "After all, if you could get VF2 and Sega Rally on Playstation, no one would buy a Saturn, would they?" - Despite the 8/10 score for Ridge Racer Revolution, they really slate it in the review, stating that it's basically exactly the same as Ridge Racer and that they are very disappointed with the lack of options. It certainly doesn't read as an 8/10 review.